Alas, now I tend to only have time to make bread for holidays and special occasions. But there is a bread that’s not really a traditional bread, but you can act like it’s a bread and bake it up really quickly. 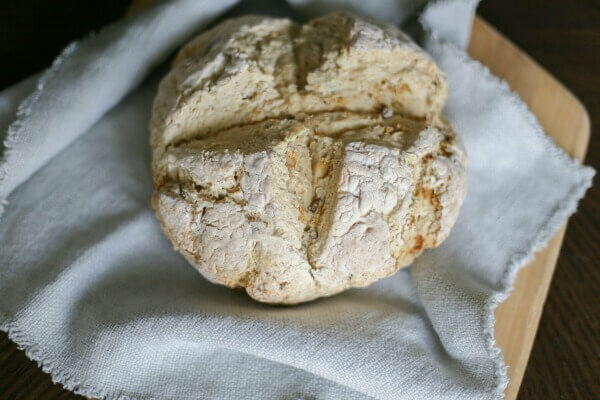 That would be Irish Soda Bread and I am sharing this recipe so you can make it from scratch and impress your family on St. Patrick’s Day next Friday. 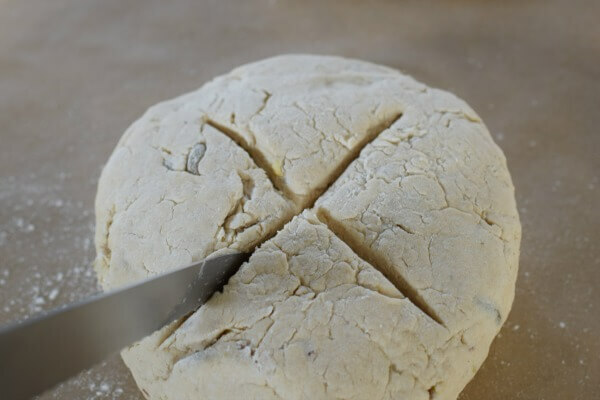 Irish soda bread is made from very simple ingredients: white flour, baking soda (which acts as a leavening agent instead of yeast), buttermilk or soured milk (to activate the baking soda) and salt. The classic way to make it is plain and simple without any dried fruit or sweeteners. 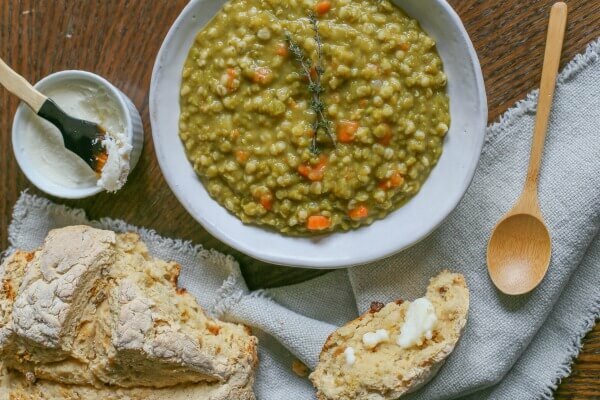 It has a soft interior and a crusty exterior and Irish soda bread is a lovely addition to a stew, soup or even for breakfast with some eggs. Irish soda bread won’t have the stretchy chewy texture of a yeast bread, instead it is like a dense quick bread. My family prefers it when I add a few bits of currants or in this case, green raisins. Keeping the green theme, I also stirred in some pistachios in this version which added some great texture. Nuts and fruits in or out, soda bread warm out of the oven is a comforting food. The day I made this, we slathered slices of the bread with a salted grass-fed butter and I can’t tell you what a treat it was. That brings me to my next point. Irish soda bread is not exactly health food. 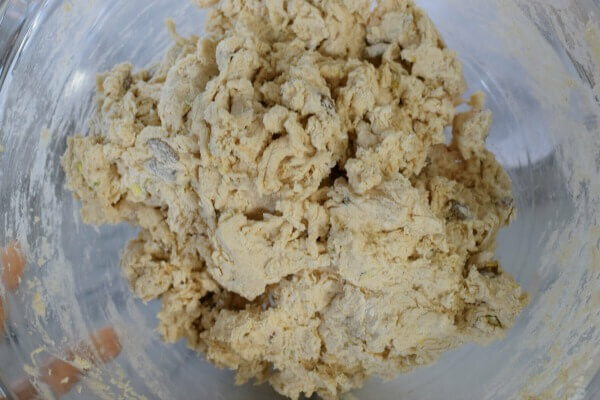 I make it with half whole wheat flour or half whole spelt flour to up the fiber a little, but flour is flour and therefore I consider this a higher glycemic food. I’ll admit, even though my family went crazy for it, I only make it on St. Patrick’s Day. If there are leftovers, I usually wrap them up in plastic wrap or tuck the loaf into a glass container with a lid. The bread stays pretty well for another day or it’s also excellent toasted. If you have a busy week (and who doesn’t? ), you can even make a loaf over the weekend and freeze it for next Friday. Allow the bread to cool completely, wrap it well in plastic wrap or aluminum foil and freeze until Friday morning. It can defrost on your countertop. Why not stick it in the oven to warm through before dinner time? Lucky family! Whisk whole-wheat flour, all-purpose flour, baking soda and salt in a large bowl. Stir in pistachios and raisins. Make a well in the center and pour in buttermilk. 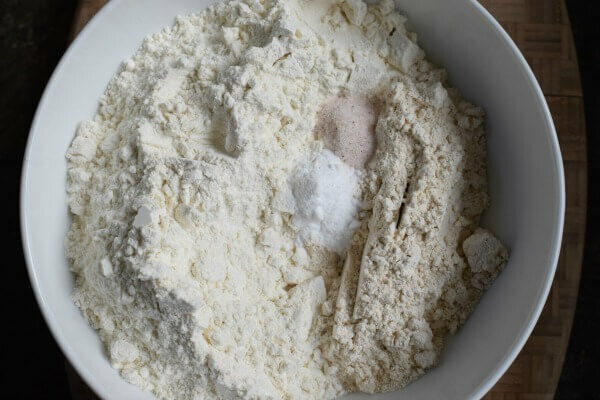 Using one hand, stir in full circles (starting in the center of the bowl working toward the outside of the bowl) until all the flour is incorporated. The dough should be soft but not too wet and sticky. When it all comes together, in a matter of seconds, turn it out onto a well-floured surface. Clean dough off your hand. Bake the bread for 20 minutes. Reduce oven temperature to 400 degrees and continue to bake until the loaf is brown on top and sounds hollow when tapped, 30 to 35 minutes more. Transfer the loaf to a wire rack and let cool for about 30 minutes. Could low-fat sour cream be incorporated into this recipe? I think if you did half sour cream and half milk, it would turn out well. Is there a GF flour combination you recommend for this bread? I have yet to test the recipe with gluten-free flours, but King Arthur Multi-Purpose GF flour + some xanthan gum has never let me down. I use it one-for-one with regular flour.